Species Listing Status: Limnanthes floccosa ssp. pumila is listed as Threatened by the State of Oregon and is considered a Species of Concern by the U.S. Department of Fish and Wildlife. 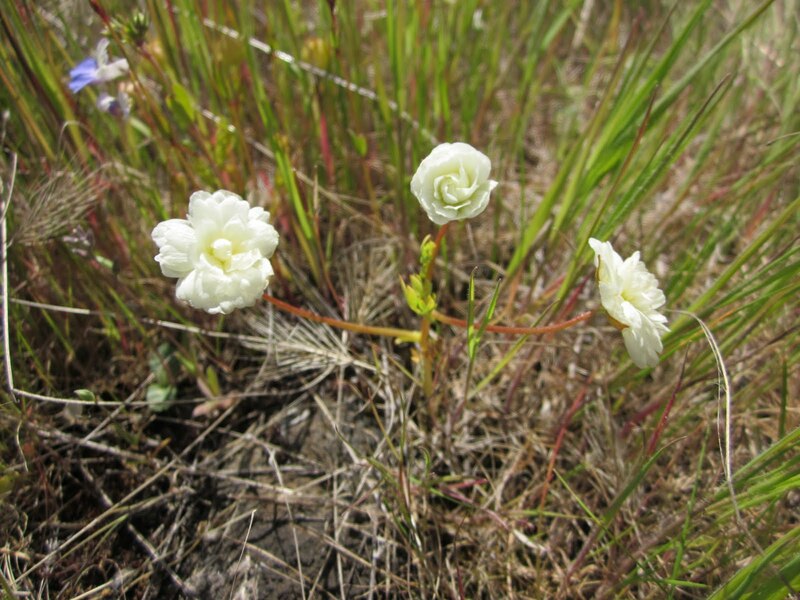 Distribution: The only two known populations of Limnanthes floccosa ssp. pumila are located on Upper and Lower Table Rocks in Jackson County, Oregon. The habitat here is an impermeable volcanic plateau with mounds, flats and vernal pools. The L. floccosa ssp. pumila populations are concentrated in the vernal pools and seasonally wet depressions. Upper and Lower Table Rocks are owned by the Bureau of Land Management (BLM) and The Nature Conservancy (TNC), respectively. This land is protected as an Area of Critical Environmental Concern (ACEC) on BLM land and as a preserve on TNC lands. Project Description: Major threats to L. floccosa ssp. pumila include exotic weeds and recreational use of the Rocks. Before acquisition by the TNC, Lower Table Rock had been used for cattle grazing. Over the course of several years, IAE has collected data to determine population trends and the effects of these threats on the population. Our research involved monitoring previously set up plots under different experimental parameters of trampling, grass removal and grazing exclosure. We also obtained information about disturbance and native and non-native species abundance in the plant community through monitoring transect lines laid out across the plateaus. Identification Tips: Limnanthes floccosa ssp. pumila is a low lying annual flower reaching heights of five to ten centimeters. When in bloom from March until May, it can be distinguished by its five white petals that have prominent venation and five green sepals that alternate with the petals. 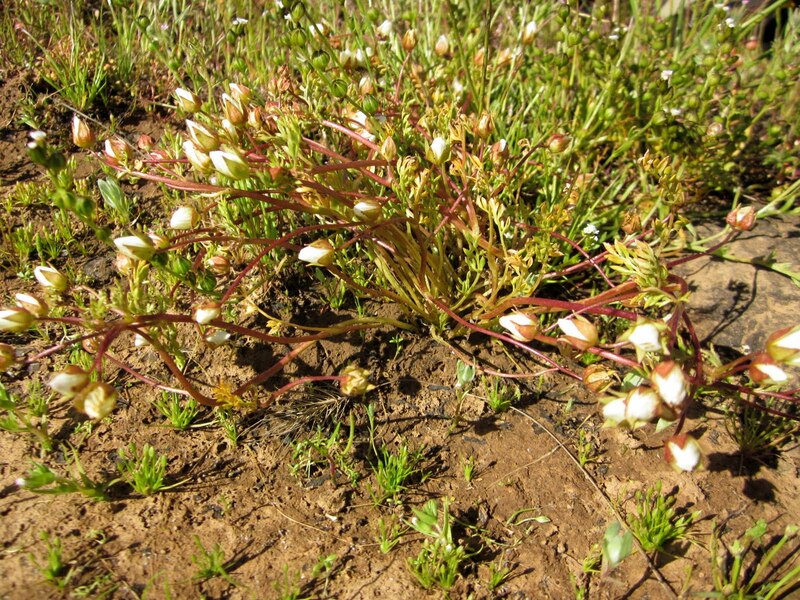 The leaves are pinnately divided and, unlike the other two subspecies which occur around Upper and Lower Table Rocks, the leaves and sepals are hairless. Susan K. MacKinnon's book, Flowers of the Table Rocks, was a helpful, comprehensive guide to the flora of this ecosystem. Interesting Facts: Limnanthes floccosa ssp. pumila is geographically isolated and only grows on the Table Rocks in Oregon, an area of only about seven and a half square miles! Also, it is related to the cultivated species Limnanthes alba (white meadowfoam) which is used to make meadowfoam seed oil, a highly stable vegetable oil. For more information follow the link to the full report: Threat Assessment for Limnanthes floccosa ssp. 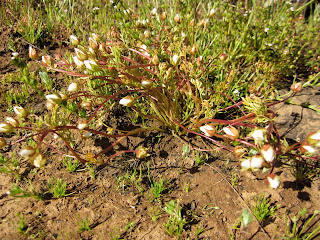 pumila and Callitriche marginata on Table Rocks ACEC, Medford District BLM. Rare specimen of L. floccosa ssp. 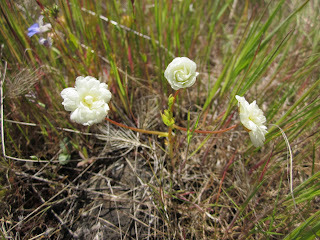 pumila with multiple petal whorls.